Deploy in under 5 minutes – Pre-configured VMware Virtual Appliance, Synology NAS package, 1-click Windows installer, 1-command Linux installer, pre-configured AWS Amazon Machine Image. Protect VMs – Native, image-based, application-aware VMware/Hyper-V/AWS VM backup and replication. Increase backup speed – Forever-incremental backups with CBT/RCT, LAN-free data transfer, network acceleration. Ensure recoverability – Automated screenshot verification, backup copy offsite/to the cloud. Decrease recovery time – Instant recovery of VMs, files, Exchange objects, Active Directory objects, DR with VM replicas. Headquartered in Silicon Valley, NAKIVO Inc. is a privately-held company founded in 2012. 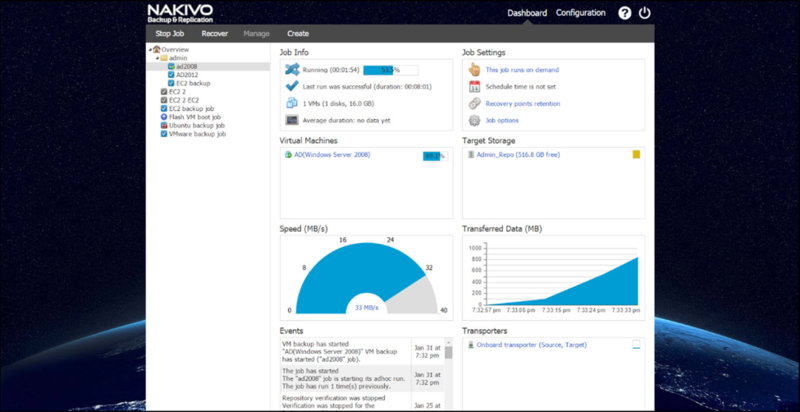 NAKIVO develops a fast, reliable, and affordable data protection solution for VMware, Hyper-V, and cloud environments. Over 10,000 companies around the globe use NAKIVO Backup & Replication to protect and recover their data more efficiently and cost-effectively, while over 120 hosting, managed, and cloud services providers are using NAKIVO’s software to deliver VM BaaS and DRaaS to their customers. NAKIVO has a global presence with over 1,600 channel partners in 117 countries worldwide. Visit www.nakivo.com to learn more.